She bought a map of the area and was learning all the names. To the west of the Cobb was Monmouth Beach, and farther along, Pinhay Bay, but her favorite place was still Lyme. She loved the view across Lyme Bay to the great hulk of Golden Cap, and on a very clear day, it was possible to see as far as the Isle of Portland. Reading Dreaming of Mr. Darcy made me want to do two things: Visit Lyme Regis and re-read Austen’s Persuasion. In fact, I’ve already pulled my copy off the shelves. In earnest! Why this book (Dreaming of Mr. Darcy by Victoria Connelly) isn’t entitled Dreaming of Captain Wentworth though is a mystery to me. In any event, the main character, Kay, inherits a bundle of money from an elderly Austen-loving friend who had recently encouraged her to follow her bliss. So Kay kisses her old life goodbye and impulsively purchases a large (pink) home in Lyme Regis with ambitious plans to convert it into a bed and breakfast. And so she does. Quite successfully. Her new establishment, The Wentworth (see what I mean? ), opens for business. By chance, a new film version of Persuasion just happens to be shooting in the area and actors are in need of rooms. Handsome British actor, Oli Wade, proudly fills the vacancy along with two self-absorbed actresses (set to play the roles of the Miss Musgroves which makes perfectly good sense). The dialog between Kay and Beth (the diva playing Louisa Musgrove) is perhaps my favorite part of the book. And of course Adam (the “perfect” guy) is quite likable. Kay, however, does not notice this fact and gets no sympathy from me. (She’s a bit of an idiot in the romance department). 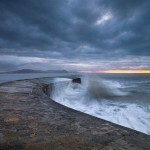 What would Lyme Regis (the real star of the book) be without The Cobb? Truth be told, it’s always had a sort of creepy appeal to me. A seaside mega-snakelike structure jutting out into the sea — dangerous waves crashing to and fro — yet nestled within a quaint little town of pastel colored shops and cottages that smell of Yankee candles and blueberry scones. I must admit, the striking contrast of Lyme Regis (between death-by-drowning and bicycling-to-the-bakery) intrigues the tourist in me. Lyme Regis really was a pretty town, and it was easy to see why it had been attracting tourists since Jane Austen’s time. Its harbor was full of colourful boats; its ros of bay-fronted cottages and candy-coloured beach huts looked jolly and welcoming, even in the most unpromising of weather, and she loved the wooded cliff that rose up behind the town. She wised she could pack a rucksack and lose herself in the famous Undercliff. All in all, Dreaming of Mr. Darcy is a whimsical read. If you’re planning a trip to Lyme Regis, this would be a fun book to read on the flight. You should also bring a copy of Persuasion. But, that goes without saying.